Cara Finnegan is a writer, teacher, and historian of photography. Her books and essays explore the role of photography as a tool for public life. Her latest book is Making Photography Matter: A Viewer's History from the Civil War to the Great Depression (University of Illinois Press, 2015), which won the National Communication Association's 2016 Winans-Wichelns Memorial Award for Distinguished Scholarship in Rhetoric and Public Address. It was published in paperback in August 2017. Finnegan's ideas about photography have been featured in a variety of publications in the fields of Communication and U.S. History, as well as in popular media outlets such as CBS, the New York Times​, the BBC, Chicago Public Radio, Vox, and Reuters. She is also affiliated with Reading the Pictures, a non-profit site dedicated to the analysis of news photos and media imagery. For over a decade, she has moderated the Reading the Pictures Salon, real-time, online discussions where photojournalists, political commentators, and academics explore how photography frames contemporary social and political issues. Beginning in 2018, Finnegan and Reading the Pictures publisher Michael Shaw began co-hosting a weekly, live webcast analysis of news photos called Chatting the Pictures. A native of Saint Paul, Minnesota, Finnegan received her B.A. from the University of St. Thomas in 1992, her M.A. from the University of Maine in 1995, and her Ph.D. from Northwestern University in 1999. 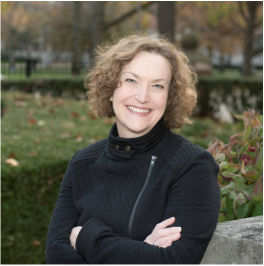 A member of the faculty of the University of Illinois at Urbana-Champaign since 1999, she is currently Professor and Associate Head in the Department of Communication. She was named a University Scholar in 2017 and holds affiliated appointments in Art History, Gender and Women's Studies, and the Center for Writing Studies. In 2016-17, Finnegan held a National Endowment for the Humanities (NEH) Fellowship to support work on her latest book project, From Daguerreotype to Digital Revolution: A History of Photography as Told Through Five Presidents. Download a full, current CV. Access Finnegan's Google Scholar profile.